Species In Genus: 1 sp. Etymology: (Pierre Hainard, Swiss geobotanist, b. 1936) Note: See Parapholis. Habit: Annual. Stem: ascending to erect, 2--5 dm, internodes solid, branched, glabrous. Leaf: sheath 1--6 cm; ligule 1 mm, membranous; blade 6--10 cm, 1--2 mm wide, generally flat, ribbed, upper surface scabrous. 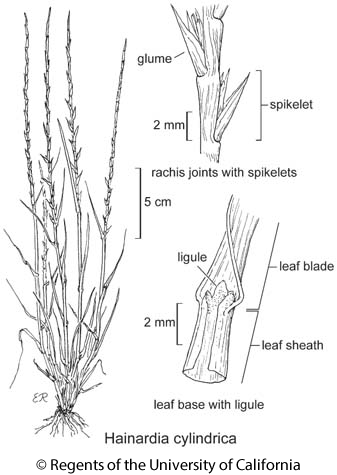 Inflorescence: spike-like, 8--20 cm, cylindric, stiff, straight, breaking at nodes; spikelets alternate, 2-ranked, appressed, embedded in axis, falling with axis segment, lowest included in sheath. Spikelet: lower glume 0 on all but terminal spikelet, upper glume 1, generally 5--7 mm, thick, rigid, margin sometimes inrolled, 3--7(9)-veined; floret 1, bisexual, or 2, upper reduced and sterile; lemma 4--6 mm, translucent, back facing inflorescence axis, 3-veined; palea +- = lemma, translucent; anther 2--3.5 mm. Fruit: 2.5--3.5 mm. Chromosomes: 2n=14,26,52. Citation for this treatment: Thomas Worley 2012, Hainardia cylindrica, in Jepson Flora Project (eds.) Jepson eFlora, http://ucjeps.berkeley.edu/eflora/eflora_display.php?tid=27553, accessed on April 24, 2019. NCo, n SNF (Amador Co.), deltaic GV, CCo, SnFrB, SCo; Markers link to CCH specimen records. Yellow markers indicate records that may provide evidence for eFlora range revision or may have georeferencing or identification issues. Purple markers indicate specimens collected from a garden, greenhouse, or other non-wild location.